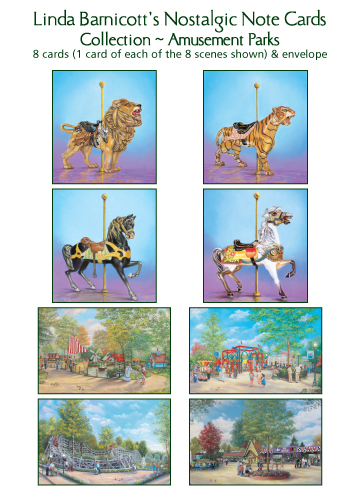 It was 1927 – A new, beautifully painted, four-row William Dentzel carousel was purchased by Kennywood Amusement Park, and for 70 years it has brought joy and smiles to children of all ages. It’s original glory and colors remain the same today. 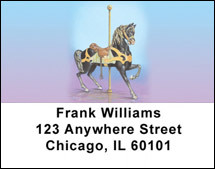 It’s Pegasus is a proud, spirited, strong-winged horse whose sole desire is to lead this historic carousel. 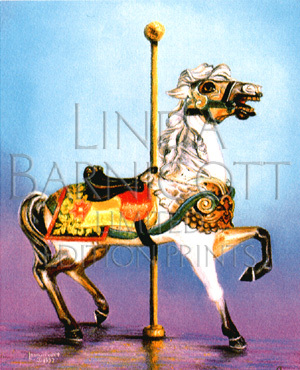 The artist, Linda Barnicott, invites you to sense the speed and feel the power of this exquisite white steed, all the while listening to the echoes of children who for decades laughed and ran to be the first to ride the Lead Horse. Once in the saddle, they were “spirited” away to where only their imaginations could take them.